I got a marriage proposal about two years ago. I knew the boy from before as we studied in the same school. My parents really liked the proposal as he belonged to a decent family. However, someone advised them to get istikhara done by a shaikh. He just asked for our names, parents names and said this marriage is not successful and after few years it will end up as divorce. I believe this is shirk and it is not the right way to perform istikhara and no one can predict future except Allah, but I am not able to convince this to my parents. After him many proposals came, but I do not feel satisfied with any and I really want to marry this guy. I want to know how can I make my parents understand that what they have done is not right? Istikhara, in reality, means “to seek goodness from Allah”Does Istikhara require lots of preparation or is it something I can do daily? Sister, Istikhaarah is a personal worship which can not be done by anyone except the one who is to take the decision. In your case, it is you and the guy who have to do the Istikhaarah. Asking someone else to perform Istikhaarah is not correct. Additionally, one who asks you your mother's name for such things is most probably misusing it. It is a sign of magicians, in fact. People who claim to do Istikhaarah on someone else's behalf are liars. Show the following hadith to your parents and tell them that the worship which is due on you is on you and not on any random Shaikh. (after "hadhal amr" (this matter) in two places, mention your marriage to this guy). Tell your parents that Allah's Messenger Sallallahu Alaihi Wasallam asked the person taking the decision/starting work to perform Istikhaarah and there ia no evidence to allow a "Shaikh" to perform Istikhaarah on someone's behalf. You must perform Istikhaarah before getting married to him if Allah Wills so. If any sheikh asks for mothers name and birthdate of the person themselves to perform 'istikhara' know that this person uses jinn. So can it be that what this person is predicting may turn out to be true? akhan12, the jinn who work with fortune-tellers mix one truth with nine lies. To consult such people is a form of shirk and is a serious sin. Istikhara is not based on names or birth dates. Please read the comments already left on the post. I'm just curious enough to know as to whether you've gone ahead with the marriage or not? Because I just had an istikhaara done too and he asked for my name, my mum's name along with the guy's name and his parents name and he also said that it would be unsuccessful and will result in a divorce shortly after marriage and with that being said, I'm scared to go ahead with the marriage but I also want to really marry this guy. M, what you "had done" was not istikhara, and was little more than fortune-telling, which is a form of shirk. 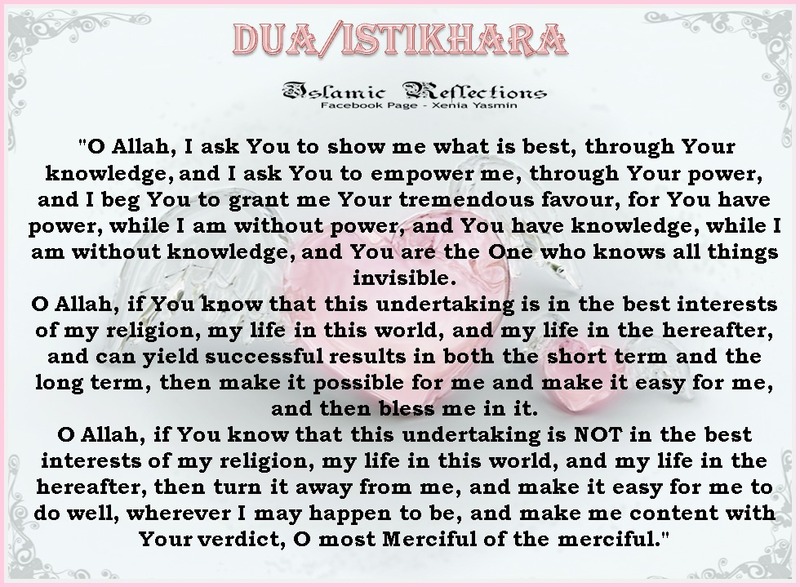 Istikhara is a personal prayer that you perform to Allah yourself, with a specific form of dua' which was taught by the Prophet Muhammad (sws). After praying Istikhara you make the decision you think is best, and trust that Allah is responding to your dua' by guiding you to what is good for you. please tell me that when no stars match in istikhara or just 2 stars match is it not consider to yes and tell me after we pray to ALLAH do istikhara ourselves then what we do we ask ALLAH to answer or we wait for some sign etc is it necessary to do decision with istikhara cant we let ALLAH ALMIGHTY take care of what will happen? please explain the person i want to marry his parents only believe in Istikhara and not leave everything in ALLAH'S Hand i heard if someones do efforts ALLAH Changes his or her destiny then why they make istikhara an issue of marriage..
What "stars match" are you talking about? What kind of nonsense is this? Did you read the answers I and the others editors already gave on this post? I love some one and shes also love me we both want to marry with each other recently i meet with with her elder sis and she said she will talk at her parents 99% her parents will be agree but the issue is that now parents are not agree while i have already informed to my parents bout her even she also meet my parents at my home now my parents is stuck on other peoples thinking and in cast . .we both dont want to leave eachother and we also cant stay without our families ..
40 is from her side ... .
Can you please let me know what should I do voz I met her today and she said that if her marriage will fix so she will take poison or she will run away from home n i am also need her with my family but my dad is saying that she from other cast what will relatives think n all etc... I also need her..